Traditional Wood & Stone Built Villa Pantelis. What better way while building a traditional house rather than a combination of wood and stone? This is how villa Pantelis is made and it is located at Eleutherna village. Rethymno city is 25 km from the villa and the nearest beach named Stauromenos is only 12 km away. The ancient archeological site of Eleutherna is close to 2 km from villa and about 8 km north east there is Moni Arkadiou, a place that flourished from the dark ages of Greece's early history until Byzantine times. The villa can accommodate up to 9 people in 2 double bed bedrooms, 2 twin bed bedrooms and 4 bathrooms. It has been recently renovated, a work of art from local house builders. Beautiful, relaxing landscape and village views will please you while sitting at the sun beds next to the pool. Villa Pantelis is surrounded by green tree and mountain views offering a soothing experience to your eyes. It is a cozy villa with wooden roofs and floors, warm atmosphere and the furniture has been chosen with traditional style in mind. It's like living in the past, but all modern comforts are available and will satisfy any guest requirements. 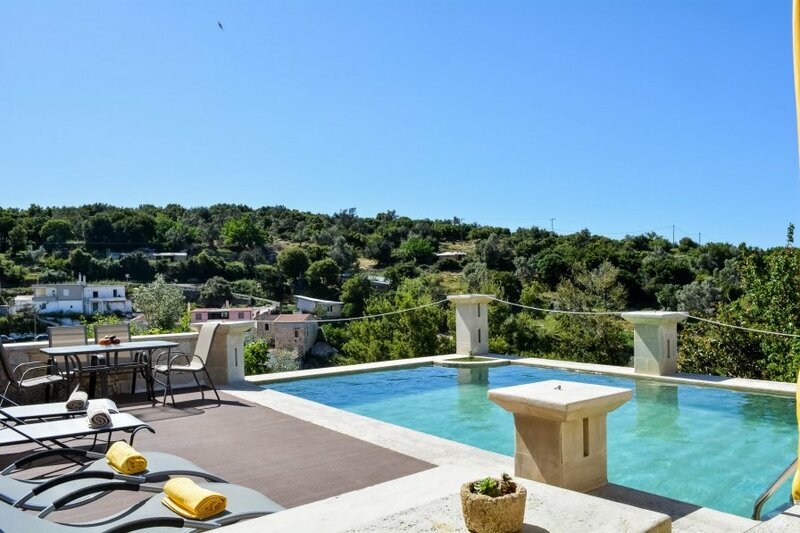 The villa offers a fully equipped kitchen, wireless internet, a safe in every bedroom and there is air condition in all the communal areas of the house. Villa is ideal for peaceful and quiet away from city escapes and relaxation, offering quality time with your family or friends. You can relax at the living room next to the fireplace or you can have a barbeque outside. Restaurants are only 1 km away from the villa where you can have a taste of the Greek cuisine. There are two parking spots outside from the villa.